Adobe is a company that creates multimedia visual products, so it should be no surprise that its offices are stunning, with each being a visual delight. But is that enough? According to Eric Kline, Director of Global Workplace Design at Adobe, the answer is no. Adobe believes its workspaces “need to create and amplify culture through all of the amazing experiences that bring people together and allow them to be their best self,” says Kline. With this goal, the Adobe team set off to create offices that are more than just spaces–they are spaces that engage and speak to their employees. They’ve done this by using design techniques that take into account all of our senses and reflect all of our differences. “Because people are so different in how they live and how they work, we wanted to make sure that not one sense or one type dominated the design, but that they are all taken into account and layered into the experience” says Kline. 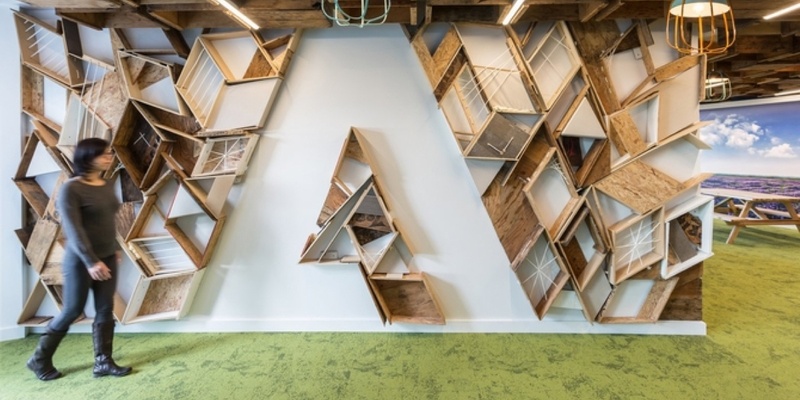 Adobe offices have not only won awards for the design, but it’s contributed to the company landing coveted spots on Fortune’s “100 Best Companies to Work For” and Glassdoor’s “Best Places to Work” lists. We try to find unique yet natural ways to bring our people and innovation together. Adobe’s offices have been designed to stimulate each of the five senses to deliver the greatest impact and experience for the workforce. Each sense has been considered, individually and collectively, to transform Adobe offices into spaces that evoke emotion and increase engagement and productivity at many levels. Colors have been used to influence behavior and create energy. Sustainable natural materials such as wood and plants have been used to bring the calming effects of nature into the office and, at the same time, show respect for the environment. Scents have been used to help employees feel calm, invigorated or welcomed. Even music has been used thoughtfully to drive comfort levels and enhance conversations. An example is the newly renovated auditorium at their San Jose, California, headquarters. It previously had a corporate feel with marble floors and walls, artificial plants and a sterile staircase, which was less a reflection of the Adobe brand. “It could have been any company,” says Kline. The team completely transformed the space, bringing in colors and textures, as well as immersive environmental branding, to make it look and feel like an Adobe space and experience. Find ways to bring each of your senses into the workspace. Making even little changes and adding small touches can make a difference in creating a better experience for your workspace. Find ways to make your office more than just a space, creating experiences to appeal to your entire workforce.